These two crazy kids have been making movies since Full House ended in 1995. I have had the unfortunate pleasure of seeing several of these movies. I'm not proud, mind you. I'm just saying. 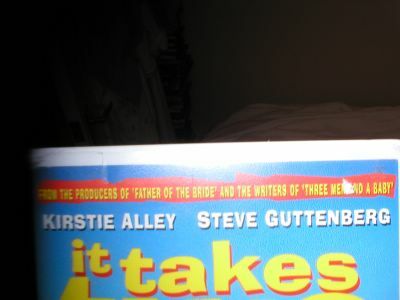 However, I seem to have missed the "classic" 1995 film It Takes Two starring one Mister Steve Guttenberg along with Kirstie Alley, in what was in a string of bad post-Cheers films. Clearly, we are a the height of Alley fame here, as she trumps our man in the credits game. It's basically a poor man's Parent Trap. It's even a poor man's Parent Trap remake. 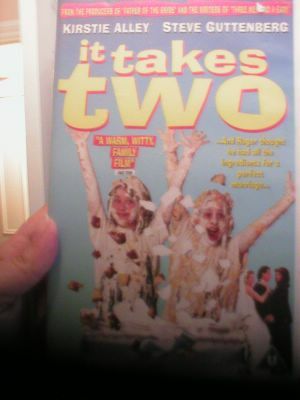 In terms of acting ability, the Olsens definitely rank behind both Hayley Mills and Lindsay Lohan. And they only have to play one twin each. Slackers. They don't seem to be actual twins though - they're identical strangers! You know how often that happens. I think I saw it on the news yesterday. Anyway, Steve-o plays the dad of the rich twin, Alyssa. Kirstie is the case worker of the poor twin, Amanda. She wants to adopt her, but the man gets in the way because he doesn't want kids adopted by poor, single moms. Steve has fallen in love with a rich lady, Clarice (Carol from Friends in a BAD wig), who, you'll never guess, is eeeeeeeeevil. By a completely wacky coincidence, Amanda ends up at a summer camp across from Alyssa's house. If you can't guess the plot from here, then I am so, so sad for you. You need to stop having a real life and sit down on your couch and watch a LOT more bad tv. There's not really more to say about this movie. It's an Olsen Twins movie. Of course it's bad. But Steve's not too bad, consider he's in a freakin' Olsen Twins movie. And isn't that what matters? **Edited to add - I've just found out I know the woman who did extras casting on this movie. I'm one degree from the Gutt!